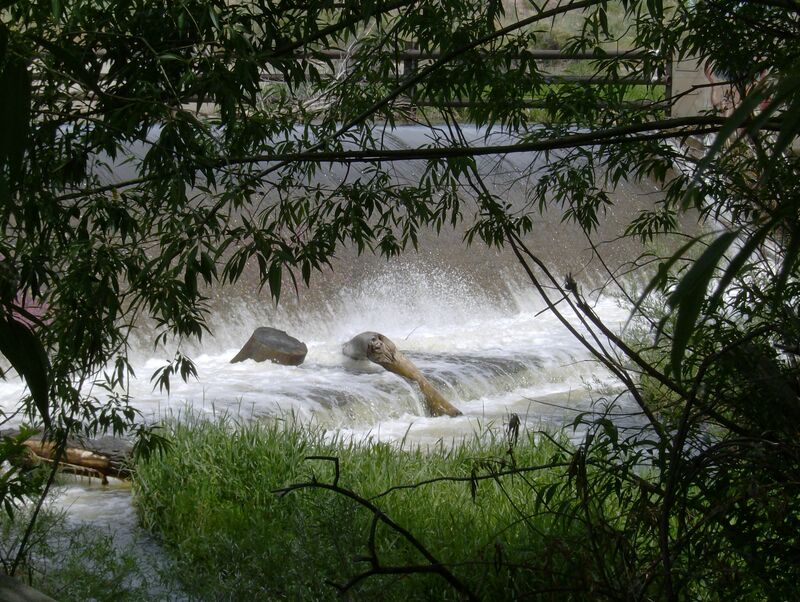 The Big Thompson River, Loveland, CO., a spillway near the walking/biking trail. 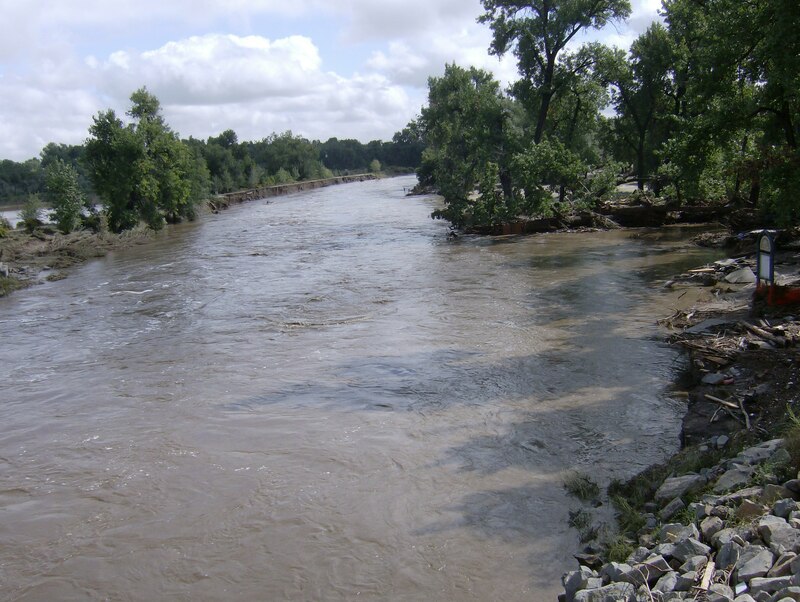 This photo was taken earlier in the spring when runoff and water levels were normal, before the flood Sept. 12-16, 2013. The trail, bridge and path is now washed out and will not ever look the same as we enjoyed it nearly every day as we went walking along the river here. 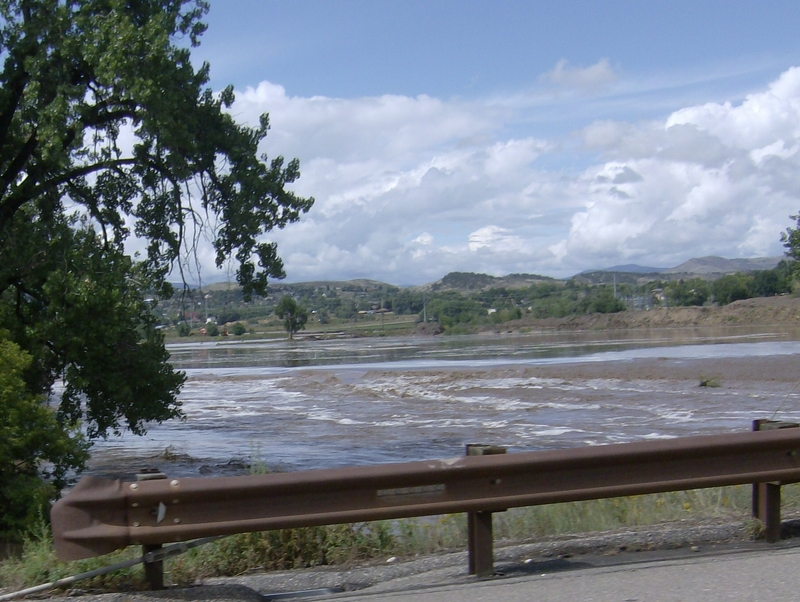 It has been a whole week since our region, towns and front range along the Rockies has been inundated with flood waters. When the sky is cloudy and overcast, the rain still falling, and the sun not seen for days, one looks, hopes and prays for the rainbow expected at the end of a storm. But, sometimes the rainbow is not where we expect to find it as we have seen lately here. It instead is seen emerging from a window opened to us through the opportunities of a community coming together out of necessity and circumstances, bonding together, mutually supportive of one another through prayer and service. That is what happened here in Colorado with the recent floods, and even through the wildfires experienced here in 2012. The experience draws neighbors and people together that have never met. Friendships are born, and we learn life lessons that will remain with us, hopefully not ever forgotten. The road to rebuilding does not stop with the tangible ones we took for granted on all our trips and outings up 34 highway to Estes Park and Rocky Mountain National Park, to campgrounds and picnic grounds along the way. It is the rebuilding of a part of life for some who have lost their homes to these storms and fires that teaches us all that though the body can grow tired and weary in the process it is the spirit of determination and resolve to move on, remember the past, but not live in it. We will do that here. Yesterday, I spent four hours along with my husband and other volunteers as we came together to serve and help those who were evacuated from their homes, damaged or lost entirely to the flood. It is during these times, working together that we think how fortunate we are to have a warm, dry house to go home to when hundreds of others have lost theirs, or cannot return because it is contaminated and unsanitary with affected, polluted water, the same water that looked so clean, calm and peaceful when I walked the trail along the river with my husband and dog just a few months earlier, nearly every day. Now there is a major highway, roads and bridges washed out, walkways, bike trails and landscaping, prairies and farmland completely flooded, altered, damaged and changed that will take months or years to rebuild. But, it is the work we can do with our hands, smile, offer a hug, and a prayer that helps another. It brightens their day, as it does ours. Those are the rainbows we see, and it is enough for now. This is a photo I took from a street overlooking the same walking/biking trail we took. 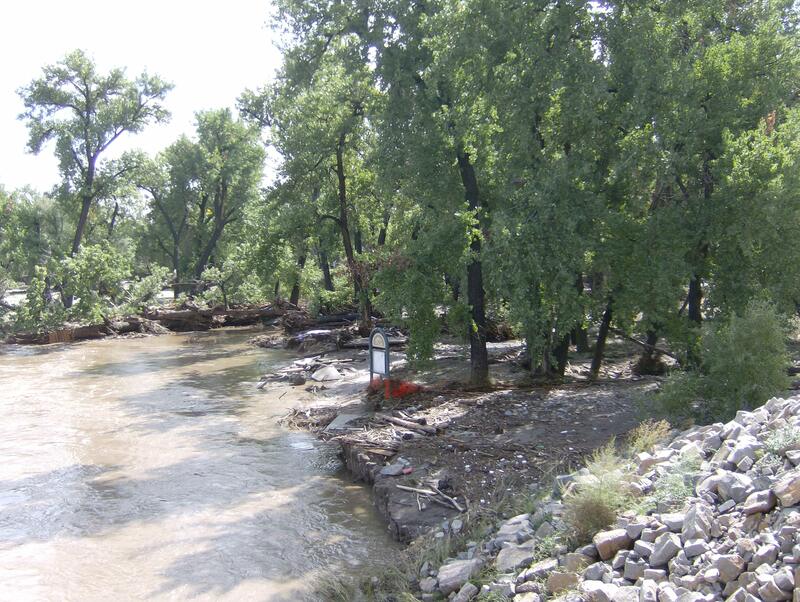 The heavy steel bridge that crossed it to another side of the river is now gone, completely washed out by the force and current of the Big Thompson at flood stage. The last big flood before this one that did much the same damage, but not as bad was in July 1976 with over 100 people killed.